It’s time to SERF or in this case it is time to Rollyo. Last week, Ryan Saviano gave us a blast from the past by reintroducing Lycos.com. This week, let’s welcome the future of search engines and what they can do for you. 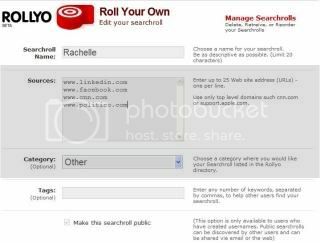 Rollyo.com is a customizable search engine in beta that allows searchers to “roll” their own search engine. It is all about making things customizable and gaining trust these days and that is exactly what Rollyo.com does for their users. Like the iGoogle, searchers can create a customizable search engine page. While it doesn’t have all the pretty themes and additional applications, it does allow “search rolls”. Searchers create a search roll by choosing themes/categories that best fit what they search. For example, if you are a diehard fan of Brangelina and want to know what kid they are going to adopt next, well look no further, just use Rollyo to add a ‘celebrity gossip’ search roll so the query only displays results from celebrity gossip sites. I mean, what does CNN know about Brangelina anyway? 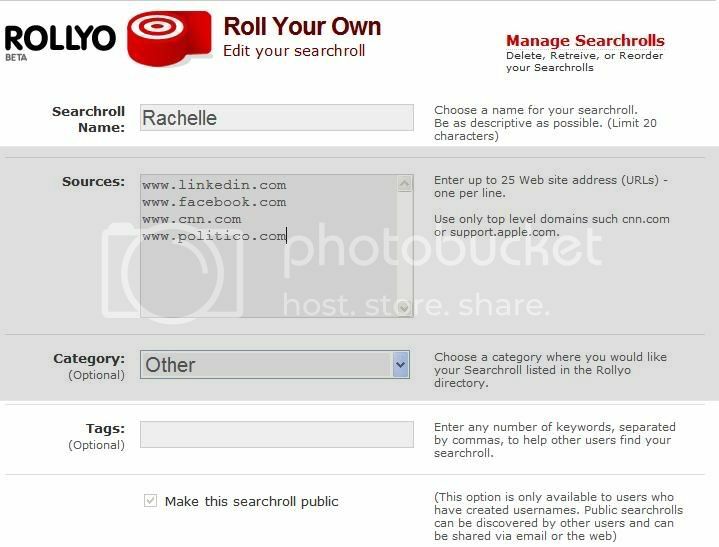 In addition to standard themes and categories, searchers can create their own personalized search roll (see above “Rachelle”) and populate this section with some of their favorite sites so the queries only bring back results from the sites listed (see below). For beginner users, Rollyo has a starter kit available and for “high rollers” your search roll, if popular enough, will join the likes of Diane Von Furstenberg, Rosario Dawson and Briane Greene (maybe we can find out where Diane gets her inspiration). So start SERFIN, or err Rollin!